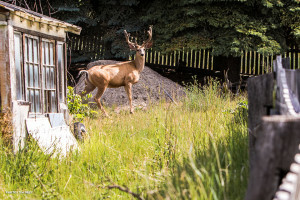 The Village of Radium Hot Springs is perhaps the best place in Canada to view exquisite mountain wildlife. 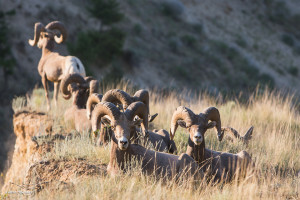 The town’s small footprint combined with its location of connecting the Sinclair Canyon to the Columbia Valley make it a natural thorough fare for many forms of ungulates, big predators and interesting birds. Combined with sprawling wetlands and the expanses of agriculture land to the north and west, a visitor is nearly guaranteed to have sightings of rare and unique Wildlife during their vacation here. Look for the sheep sunning themselves in the morning on sunny prows until the heat picks up and they seek shade. It’s not uncommon to see the herd roam through town in the evening time. As the shadow line of the sunset creeps up the valley the sheep will trend to stay in the evening light. The sheep are used to humans but they should never be approached. The force at which the males collide with each other in the late fall should be enough to convince anyone to give the animals their space. Mule and whitetail deer, elk, goats and the occasional moose make up the other ungulates often sighted in the area. It is also not uncommon to view mountain goats clinging to seemingly impossible stances on the rock walls as you travel through Kootenay National Park. 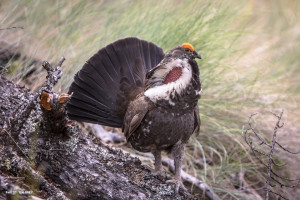 Being surprised by a beautiful game bird is also a common experience. The forest floors have many of these camouflaged birds. Visitors are reminded that interacting with any wildlife during their stay here should be non-invasive. Feeding wildlife is not permitted whatsoever and harassing them can carry a hefty fine. Be cautious if you are in your vehicle around the animals. If you choose to view the animals from your car be aware of the traffic around you. The Canadian National Park guidelines for wildlife viewings state that visitors must stay outside of 30 meters from all animals and 100 meters away from large ungulates and predators. It is very common to come closer than those distances by just driving on the paved roads but when this happens it is the visitor’s responsibility to be respectful of animal’s intentions and space. 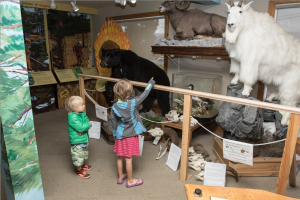 Stop by the Radium Hot Springs Visitor Information Centre on the south side of town to view the wildlife display. The mounted wildlife on display are all local to the area including bear, cougar and goat. Learn about the Radium’s resident wildlife habitat at one of the many interpretive talks provided by Parks Canada at Redstreak Campground during the summer months. and above all, make sure your camera is ready! In most places of the world seeing animals this close requires entrance to a zoo. In Radium, nature is still abundantly interactive.